Your skin type is determined by how much oil your skin produces. Diet, stress, medication, environment & skincare regimen can all effect the oil production. Here is how you can recognise which skin type you have, so you can find the best skincare remedies. Your skin looks shiny & slippery throughout the day, with enlarged pores situated around the nose, chin & forehead. You keep blotting your face with blot paper or blot powder often & your skin probably feels greasy after a couple of hours & your makeup doesn’t last the entire day. This skin type is prone to a lot of blackheads, whiteheads & acne. Use a mild cleanser on your face when you wake up and before going to bed, accompanied by a light, oil-free moisturizer. Moisturizing oily skin is VERY important, because often your skin isn’t hydrated enough, for which it compensates by producing extra oil. Exfoliate on alternate days to unclog blocked pores. What makeup should you use? Long wear, oil absorbing products will work best for you. If you have large pores, first apply a primer to your skin, which will help smooth out your skins surface. Next, pick a long wear foundation that is oil-free and has a matte finish (stay away from anything that’s glossy/shiny). Once your foundation has dried & settled in, finish off with a buff of a mattifying pressed powder. For touch up throughout the day, blot lightly with a tissue & then add another dusting of powder to the area you have just blotted. It is important to blot first to keep the powder from oxidizing due to the oil on your skin which might make your foundation look gray on your skin. Your skin appears scaly, flaky, tight & cracked. It feels tight after cleansing & dry when touched hence craving moisture. 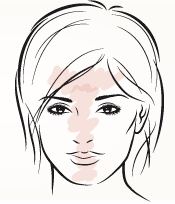 People with dry skin have a tendency to experience red patches. Areas around blemishes get flaky & you may see extra redness. Use a gentle, hydrating cleanser morning & night, accompanied by a rich moisturizing cream. Exfoliate gently with a washcloth or light scrub to remove dead skin & dry patches. Use extra moisturizer after exfoliating to build up your skin’s hydration barrier. Do NOT use products that contain alcohol, as this will dry out & irritate your skin further. Use oil to remove makeup at night & for very dry skin, give yourself a “facial” 2-3 times a week, by slathering on moisturizer and then covering your face with a hot, moist towel for about 10 minutes. Luminizing & anti-aging products will be a lifesaver! Always moisturize 20 minutes before & once that has settled into your skin, apply a primer to help smooth over dry patches. 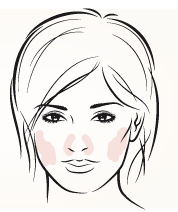 Next, apply a liquid or cream foundation & DO NOT set this with powder as powder would make the skin appear flaky. Finish off with a setting spray to help set your makeup & hydrate the face & in case you start feeling tight after a few hours. 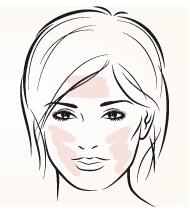 You have an oily T-zone (meaning the forehead, nose & chin). The rest of the face may have a smooth-even texture or be noticeably dry. Blackheads are often found around the nose. Your skin probably changes day by day! Some days your skin may be oilier than others & some days you might see more dryness. Ideally, you should follow the same routine suggested for those of you with oily skin. Wash your face when you wake up & before you go to bed with a mild cleanser & use a light, oil-free moisturizer all over twice a day as well. Add a bit of extra moisturizer to the areas your skin tends to be more dry. You should still be exfoliating gently once every other day to remove dead skin & unclog your pores. I recommend that you invest in two types of foundation – a long wear foundation with a matte finish for days you are more oily & creamier foundation for days when you’re really combating those dry patches. Apply a moisturizer and primer beforehand & then apply your foundation. Use a powder only over the areas you get most oily to help reduce & control shine. The pores appear small & the skin has a healthy glow. Your complexion is pretty even & you don’t often experience much oiliness or dryness. Depending on the day, you may see a bit more shine than others & sometimes you may get dry patches around your nose or near blemishes. You might have concerns with blackheads or redness. Wash your face with a gentle cleanser when you wake up & before you go to bed, making sure you remove all makeup. Apply a light, oil free moisturizer before you apply your makeup & again at night if your skin is on the drier side. Exfoliate gently once every other day to keep your pores clear. You don’t need to hide or cover up much. 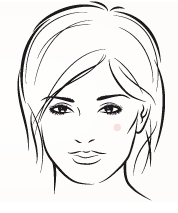 Use a light liquid foundation, BB cream or tinted moisturizer to even out your skin tone. Set this with a bit of pressed powder for added coverage and longevity. Use a highlighter cream or powder on the T-zone for that natural sheen & glow. Now that you’ve figured out what type of skin you have, there are two additional skin categories that may or may not afflict you. Many people believe that “sensitive” or “acne prone” are skin types, but they are not by themselves – you might have dry, acne prone skin or combination, sensitive skin for instance. You might even have both acne prone & sensitive skin or neither at all. Either way, there are special ways you must cope with sensitivity & acne, on top of what you do for your oily, combo, normal or dry characteristics. 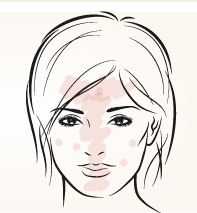 Your skin experiences red patches, minor pain, severe dryness, rashes & feels irritated. The skin seems to be delicate & with fine pores. It may have broken capillaries around the nose or on the cheeks. You probably are limited by what products you can use because you might react to certain ingredients. Use the gentlest products you can find, keeping away from ingredients such as alcohol, salicylic acid, benzoyl peroxide & perfumes. Stick to fragrance-free products designed for sensitive skin types. Make sure they are allergy-friendly & always test new products on a small area of the skin before applying to your entire face. 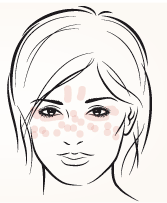 Easiest to figure this one out – Your skin always seems oily & breakes out in raised bumps. Your acne could be caused due to stress, hormones, diet or extreme weather conditions. The strictness of your skincare routine must be very firm & you shouldn’t skip a day EVER. Keeping your skin moisturized & balanced is very important & it is equally important to remove your makeup & any dirt or oil fully before you go to bed. Use treatments with benzoyl peroxide or salicylic acid only on the areas where you break out. To help you understand what kinds of products you should use, visit a dermatologist. You will typically need a full coverage foundation or concealer to completely hide redness. However, don’t wear foundation as often as possible, to allow your skin to breathe. Although makeup is not the only cause for breakouts, the less makeup you wear could significantly help reduce breakouts.